How do you plant a church that is family-integrated? How do you start a work that will keep the focus on God and His glory without dividing up the family at the front door? Where do you start if all you have is a deep desire and a tug at your heart and a confidence that God is calling you to do something different and new...and scary? This book is written to answer some of your questions and to confirm your deepest desires to be part of a family-integrated church that is healthy. Planting a Family-Integrated Church picks up where J. 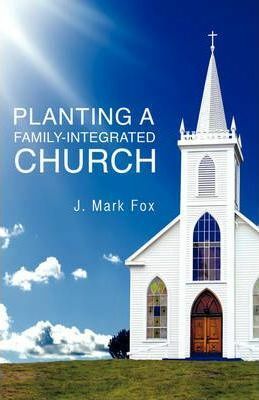 Mark Fox's first book, Family-Integrated Church left off, and gives you a workbook for change...everything from finding others with the same vision, to training elders, to choosing a name and a location, to keeping the Great Commission, to getting the word out, to dealing with buildings and bank accounts. May God get the glory as He builds His church! J. Mark Fox is the pastor of Antioch Community Church and has taught communications classes at Elon University for 17 years. He writes a weekly column for the Times-News of Burlington, NC, which has won three Amy Awards, a national recognition for "thought-provoking, skillful presentation of biblical truth, reinforced with scripture in a mainstream, non-religious publication." Mark is the author of four books, Who's Afraid of Public Speaking?, (1998) Family-Integrated Church (2006), Real Life Moments: A Dad's Devotional. (2008) and You Can Write! (2008). Mark and Cindy celebrated 26 years of marriage in June of 2008, and have seven children and one step-daughter: Micah (and Kari), Caleb, Hannah, Luke, Jesse, Judah and Susanna, ages 23 to 9. Mark's passion is preaching and writing, and he is developing a love for competing in triathlons.